A trailing succulent which grows like a ground cover. It flowers throughout summer. 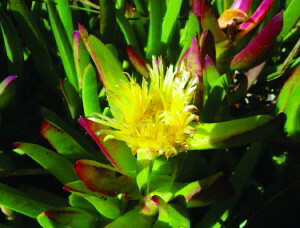 The flowers start off yellow and turn pink with age. The fruit, once dried, is used to make jam. 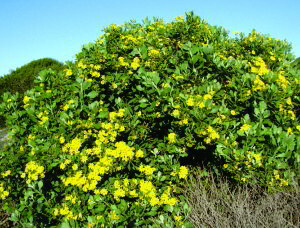 These bushes of up to 2m are covered in yellow daisy-like flowers from March to November. Some say they smell like chocolate. This is followed by red or black edible berries, which we believe were an important Khoi food. 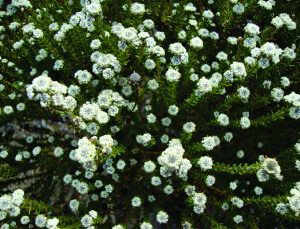 A closely, leafy shrublet with needle-like leaves. Leaves are revolute (margins rolled under). They flower throughout the year, but prominently in May with a distinct honey smell.